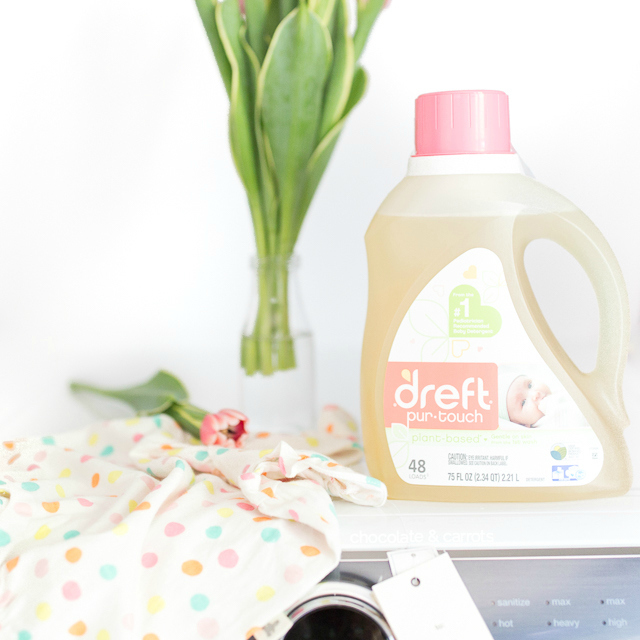 I’m honored to be a Dreft partner, helping to raise awareness about their new baby detergent product, Dreft purtouch. #purtouchWash All opinions contained in this post are my own. Please see below for additional disclosures. The excitement of a baby’s arrival can be compared to nothing but pure joy and anticipation. With all three of my babies, I’ve gotten as giddy as a 5 year old at Disney World when I start unpacking the baby clothes. And with every new baby, I’m always shocked at how tiny the clothes are! While I was preparing for our third child, Blaire, I opened up the hand-me-down baby clothes that both of my other boys had worn when they were wee ones. The clothes were cleaned prior to packing them away, but you could smell the plastic and must on them when taking them out of the bags from the attic. It was time to give them a good washing before baby #3 arrived! As funny as it may be, I don’t think Blaire wore a single one of the hand-me-down gender neutral clothes that I washed before her arrival. You see, we didn’t know her gender before she was born. As soon as her grandmothers (who were in the delivery room with us) found out that she was a girl, they went went on a major pink-hued shopping spree. We came home from the hospital with a pile of girl clothes. And to this day, she’s been showered with all things pink. Let’s be honest, Blaire has a better wardrobe than me. With all of that said, every bit of new/gently-used clothing that Blaire receives, I make sure to pre-wash. You really never know where the clothes have been or who has touched them. For all we know, a toddler at Baby Gap could have wiped their nose on the onesie before returning it to the hanger. Ew. 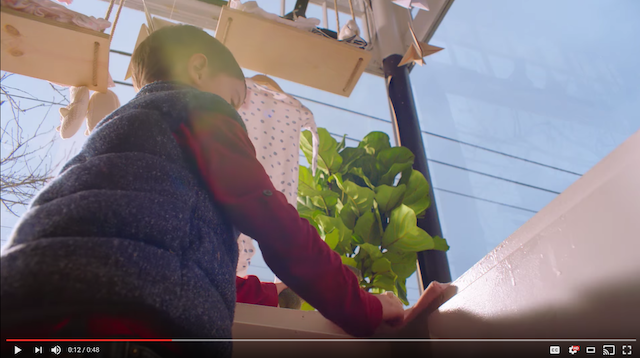 Now, I’m a pretty solid germ-a-phobe and the thought of putting not washed clothes on my babies leaves me cringing (though I have regrettably done it before…oops). In fact, 9 out of 10 dermatologists say that it is important to wash baby clothes before first wear. After thinking this through, I will now be pre-washing every baby outfit Blaire gets. And for this, I’m so thankful that Dreft has come out with purtouch. Purtouch is another option for parents who are seeking products with natural-based ingredients. 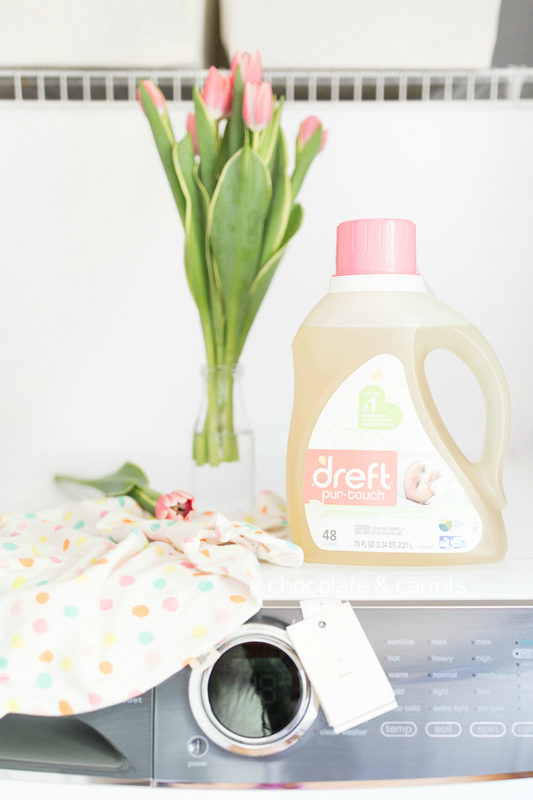 It’s the next step in Dreft’s mission of designing the best possible detergent for baby. In addition to my germ-a-phobia, I’ve become increasingly aware of what touches my family’s bodies, whether that be the detergents, shampoo, makeup, etc. I appreciate any effort to get as plant-based as possible (and if you would like any recommendations for soaps, makeup, etc. I’m happy to give you my opinion!). 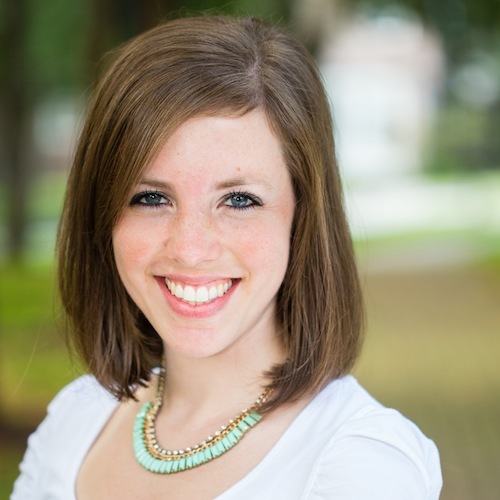 When I heard the following compelling things about Dreft purtouch, I got excited and I bet you will, too! Helps remove up to 99% of baby stains – bye bye blow-out stains! I’m sorry to say it, but the other day I made a mistake that I won’t do again. You see, I was washing some of Blaire’s clothes and I put them in with a whole mess of our family’s clothes. They were filthy (you know, dirt, urine, poo, the whole lot). Since I usually use unscented detergent, but didn’t want the clothes to stink, I used a standard detergent that had a scent. I keep a small bottle in my laundry room just for those necessary loads. Anyway, I didn’t think anything of it and dressed Blaire in the onesie that had been in the load and she ended up breaking out in a rash! Poor girl. I felt so terrible. It really is so important to use lightly scented and gently detergents on baby’s clothes. Their skin is just so sensitive! So, from now on I will be very conscious about what detergents I use on Blaire’s clothing. 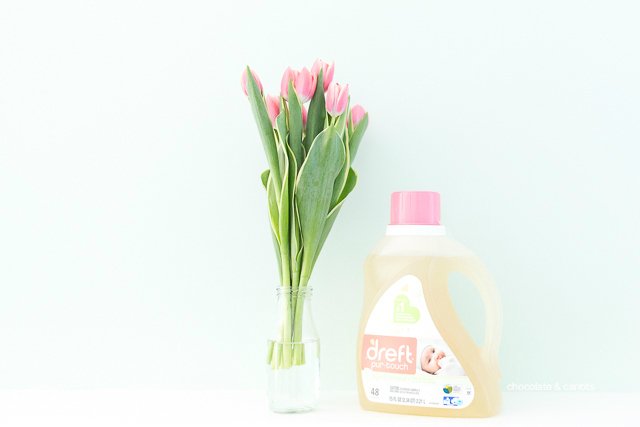 Leave a comment below to enter to win your own bottle of Dreft purtouch (75 fl oz) (only for shipping within the US). Do you have a favorite piece of clothing that you or your children wore when they were little? Do you pre wash your children’s clothing or your own clothes? 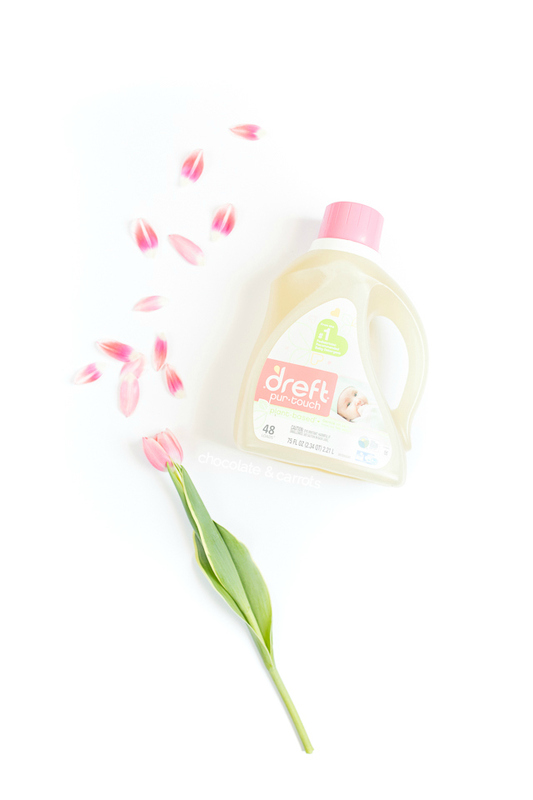 Dreft has partnered with influencers such as me to promote Dreft purtouch. As part of this program, I received compensation for my time. All opinions are my own. Dreft and Chocolate & Carrots policies align with Federal Trade Commission (FTC) guidelines and social media engagement recommendations. Please read my disclosure policy for further information. I am expecting my first and can’t imagine not washing the new clothes before putting them on my babe! I have been curious about this brand – glad to hear you like it! I have super sensitive skin (as a baby I was allergic to most disposable diapers) so I still have to use unscented, dye-free detergent. when my little one arrives I’ll definitely pre-wash their clothes! I pre washed my daughter’s clothes! I love Dreft! Really it such an informative post. I’ve read so many amazing things about your article! I like the baby wearing. It’s such a great way to be able to get things done and your baby enjoys the ride. Thanks for sharing. I totally agree with you! I pre-wash and clean everything that might have been touched by other people, call it germophobia if you want but I think that it’s easier to clean something than spending hours trying to get rid of a cold or going to the doctor. Nice and informative. This site truly helps for washing baby clothes. I have to be careful about fabric softeners and washing powders too so I can relate that you have to be super careful with little ones. This is excellent advice! The newborn baby skin is so sensitive and it is important to take proper care especially when a mom wash baby clothes. I’ve read so many amazing things about your post. Seriously thank you for all this awesomeness! Thanks for sharing such a valuable post and Keep Posting!